Candles are something I love..... a lot, and I would have cupboards full of beautiful fragranced candles if I had the space and money. Winter is the perfect time for them and I enjoy having candles burning away in the background more when it is cold and gloomy outside. They smell nice, look nice and more to the point make you look nice (everything looks better by candle light). They are just so perfect for giving a relaxing warm ambiance. 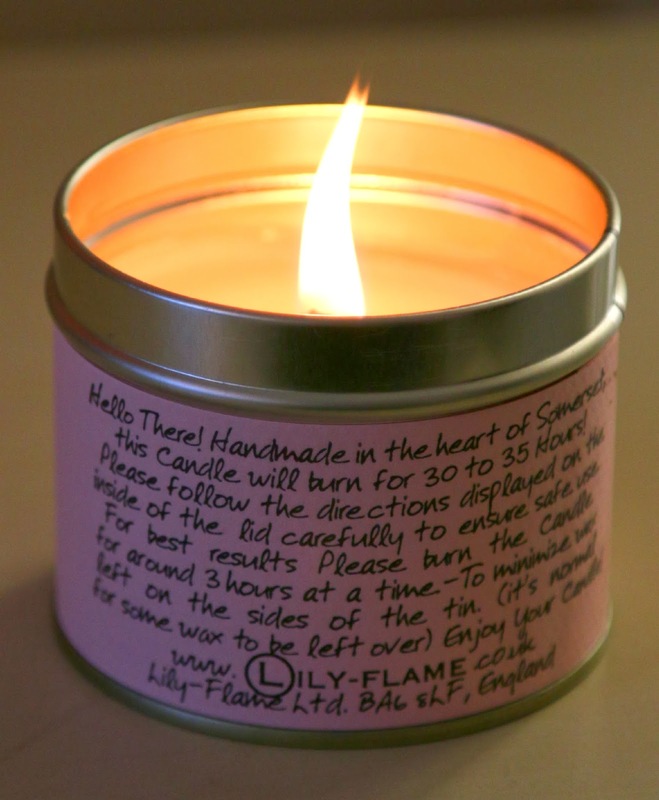 I was in one of my favourite home and gift shops a little while ago and was going through a section filled with candles by Lily-flame, they all smelt amazing and came in a cute little tin with a handmade look and feel about them. The first one I picked up was the one I fell in love with, it was called "Blush" and it smells heavenly. The fragrance was so familiar to me but it took a while for me to put my finger on what it was. Then the penny dropped, it smells like Thierry Mugler's Angel perfume. It's sweet and intoxicating and I loved it so much, the wax itself was a beautiful pale candy pink colour and the tag line on the label was "the first kiss of the night". I had to have it! I also picked up another while I was there, the fragrance was crushed almonds and it also smelt gorgeous, just like marzipan. I stood there in the shop inhaling the fragrance like a bit of a crazy person, it was just so good! Sweet almondy goodness that makes your mouth water. When I got home I couldn't wait to try one. I lit Blush first because it was my favourite, and it did not disappoint. It started burning away and within a few minutes my whole room was filled with the beautiful smell. There is nothing worse than a candle that is only fragranced when you stick your nose to the wax. I have burnt this candle quite a lot now and really love it, it estimates on the tin that each candle will burn for around 30-35 hours which isn't bad when I paid around £8.50 for it. The crushed almond although nice, isn't as strong when it burns. So Blush is certainly my favourite of the two. I liked quite a few of the other candles they did, and will go back and get a few more to add to my stash. Check them out, they are a home grown beauty of brand!